There are cases in which particular transactions take place in a scheduled manner. Such transactions can be subscriptions, monthly cleaning services, certain fees etc. Elorus gives you the option of automating their publishing process, by setting up desired frequency conditions. In order to create a recurring sales document, from the main menu select "...Μore -> Recurring invoices -> Add". Similarly, for a sales document, you select "...Μore -> Recurring bills-> Add"
First of all we have to set the invoice schedule. Define the start date that the invoice will be issued for the first time. Then, the frequency of recurrence must be filled (field named "Every") and if you wish, the end date by which the automatic publishing of documents will stop. Upon creating a recurring invoice, you may choose whether created invoices will be marked as issued or saved in draft status. Draft invoices are considered work in progress; they're are not taken into account in your reports and you will not be able to add payments to it. If you choose to create "issued" invoices, you may also want to have them sent to the client automatically. Please note that, for this option to work as expected, there must be at least one email address on the client's contact at the time the system will create and attempt to email the invoice. As shown in the image below, the rest of the fields are almost identical to those of a regular invoice. When it comes to recurring bills, you are not given the option of submitting the document's number as it will become known to you at the time you receive it from your supplier. You can also choose whether the invoices will be generated in a draft state or not. In the latter case, should you need to submit the document's number, all you have to is to convert it in a draft state from its preview page. 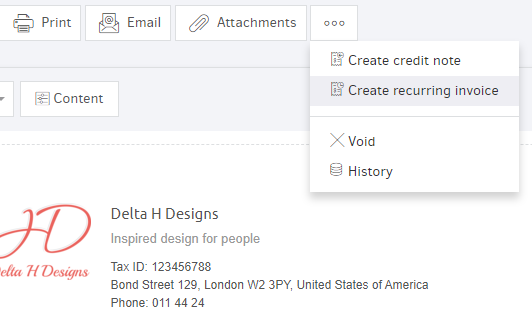 > If you have any active tracking categories for the record type you need to create a recurring invoice, you may choose it from the related field so the automatically generated documents will be assigned by default. 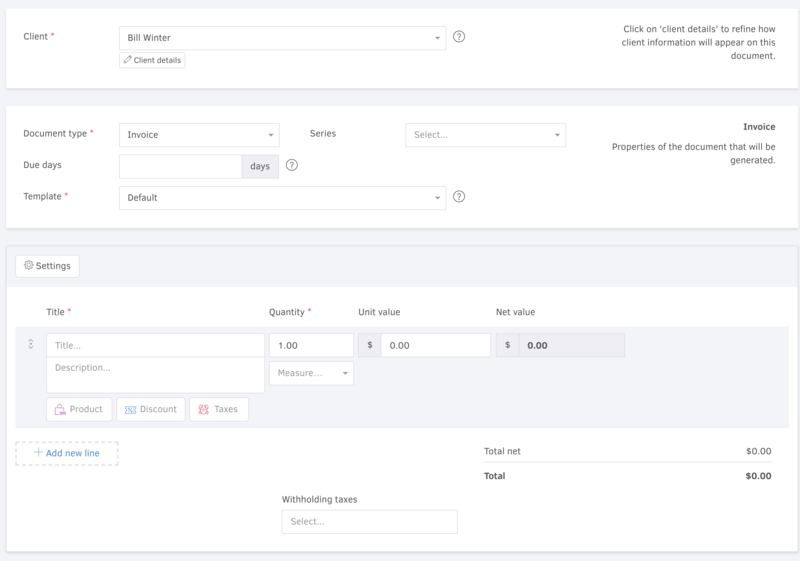 By pressing Save, a recurring invoice is generated and from the list of recurring sales/purchases you can filter results by client/supplier, document type etc. Moreover, you can hide or show columns depending on the information you need to be displayed on the list and be informed about the next execution date. Every time an invoice is automatically issued, Elorus will display a notification and send you an e-mail as well, if e-mail notifications are enabled. All documents generated in a scheduled manner will be available under the "Manage invoices" sections for sales and purchases respectively.Please note that, at any point, you can edit the recurrence conditions, as well as the invoice details, for future documents. Additionally, you can pause individual recurring invoices for as long as you wish by simply clicking on the "Active" button found in the details page of each recurring invoice. When pausing a recurring invoice the system will not automatically generate invoices during this period. You can always resume recurring invoices by clicking on the "Paused" button. If you wish to pause or resume multiple records you may do so from the recurring invoices list and the "Actions" button, as shown in the picture below. On the same list, you can see each recurring invoice's status, whether it is active or paused. Finally, if you wish to stop a document from recurring altogether, you can always delete it either from its preview page or from the Recurring documents list. In order to offer convenience, Elorus enables you to convert an existing invoice into a recurring one. From the document's view page click on (...) and then Create recurring invoice. You are then transferred to the recurring invoice's add page to continue its setup, as we described above.